Tomato Yellow Leaf Curl Virus Disease (TYLCV) | Infonet Biovision Home. Tomato yellow leaf curl virus. Note thickened shoots. 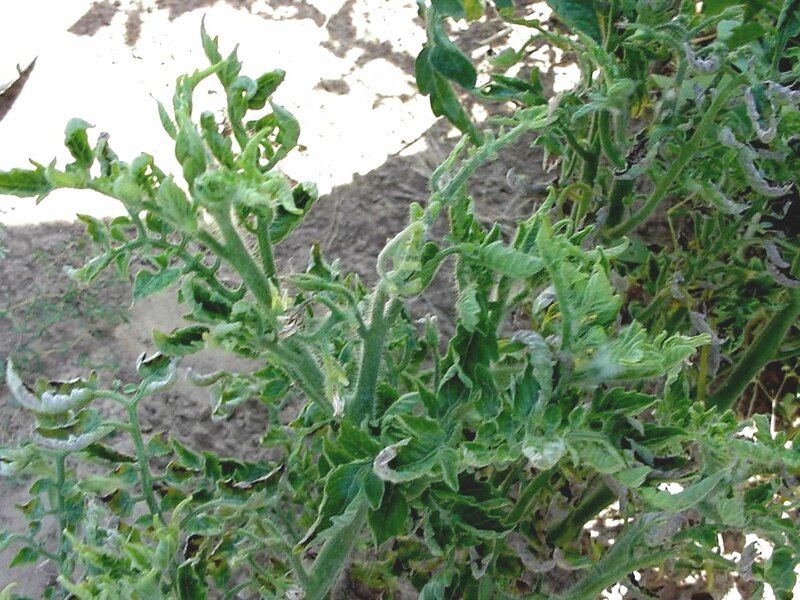 Tomato Yellow Leaf Curl Virus Disease is widely spread and extremely severe in Somalia. The virus affects yields by greatly reducing the number of fruit produced. Fruit developing at the time of infection remain on the plant, but very few fruit will set once infection has occurred. The disease can be easily recognised when tomato plants are infected at the seedling stage. TYLCV causes severe stunting of young leaves and shoots, resulting in bushy growth of infected seedlings. Tomato plants infected early in the season are normally stunted and excessively branched. Such plants have terminal and axillary shoots erect while leaflets are reduced in size and abnormal in shape. Affected leaves are curled upwards or inwards. Flower drop is common, and therefore infected plants have a reduced number of flowers and fruit. If infection takes place at a later stage of growth, fruits already present develop normally. There are no noticeable symptoms on fruits derived from infected plants. 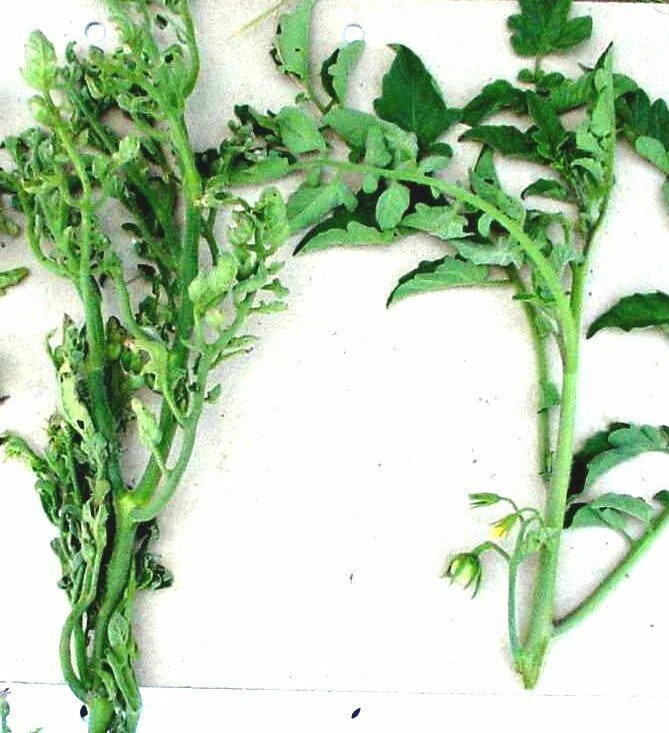 Generally, table tomatoes are severely affected by the disease, especially when infection occurs before the flowering stage. Although TYLCV has a broad host range, it is primarily known as one of the most damaging viruses to infect tomatoes. Beans (Phaseolus vulgaris) are also hosts of TYLCV and show severe symptoms after infection by whiteflies. The virus has been reported from non-solanaceous plants like sesame (Sesamum indicum), asthma weed (Euphorbia geniculata), fleabane (Conyza stricta) and oxalis (Oxalis corniculata and O. acetosella). Seedling stage, generative and vegetative growing stage. Leaves, stems and whole plant. Leaves: stunting, bushy growth; reduced size; abnormal forms. 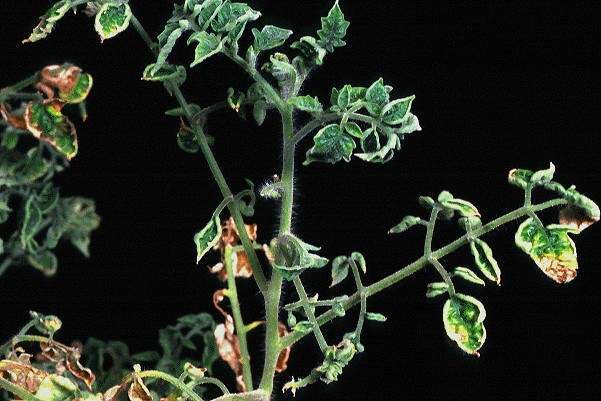 The tomato yellow leaf curl virus is not seed-borne and is not transmitted mechanically. The disease is spread by whiteflies (Bemisia tabaci). Whiteflies have a wide host range. New plant growth attracts whiteflies, which feed on the lower leaf surface. It takes about 15-30 minutes for the whitefly to become infected by the virus. The incubation period is 21-24 hours, and the transmission period at least 15 min. Further below you find concrete preventive and curative methods against TYLVC. Avoid continuous growing of tomato. Practice crop rotation by planting crops that are not susceptible to whitefly. Use resistant/ tolerant varieties, e.g. 'Amareto', 'Peto 86', 'Fiona F1', 'Perlina', 'Denise', 'Cheyenne (E448)', 'Rover'. Protect seedbeds with a white nylon net (40 mesh). Plant barrier crops like maize around tomato fields. These crops should be sown a month or two before transplanting of tomato. Mulch tomato fields with sawdust or straw. Immediately remove infected-looking plants and bury them. Do not plant cotton near tomato and/or other crops susceptible to whiteflies or vice versa.